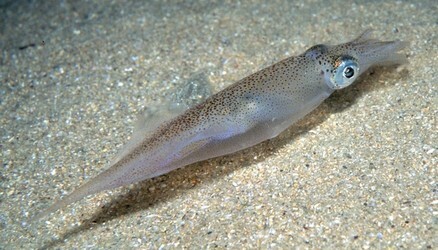 The common squid has a slender white, speckled body that can grow up to 210mm long. The posterior end of the squid tapers to a fine point. Fins are narrow and rounded around the posterior end to resemble the shape of a heart when viewed from a dorsal aspect. The had has a pair of well developed eyes for sensing the environment. Around the mouth are arms that can be up to twice the length of the head. The arms have suckers on their ends and help in manipulation of food towards the mouth. They also have a series of tentacles that aid in food capture. Spawning occurs in June and July and males and females are separate individuals. The common squid can be found from Shetland Island and southern Norway to Cape Blanc and the Mediterranean Sea. They typically inhabit coastal and offshore waters. Squid are caught and consumed by humans and can be marketed as fresh or frozen. They are also used as bait by anglers. "Alloteuthis subulata". Marine Species Identification Portal. Retrieved from: http://species-identification.org/species.php?species_group=mollusca&id=536.